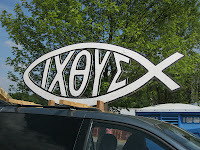 On Saturday, June 30th, I attended Creation 2012 Northeast at the Agape Farm in Mt. Union, PA. Creation is an annual Christian music festival that takes place at two U.S. venues: an eastern venue in Pennsylvania, and a western venue at Enumclaw, WA. 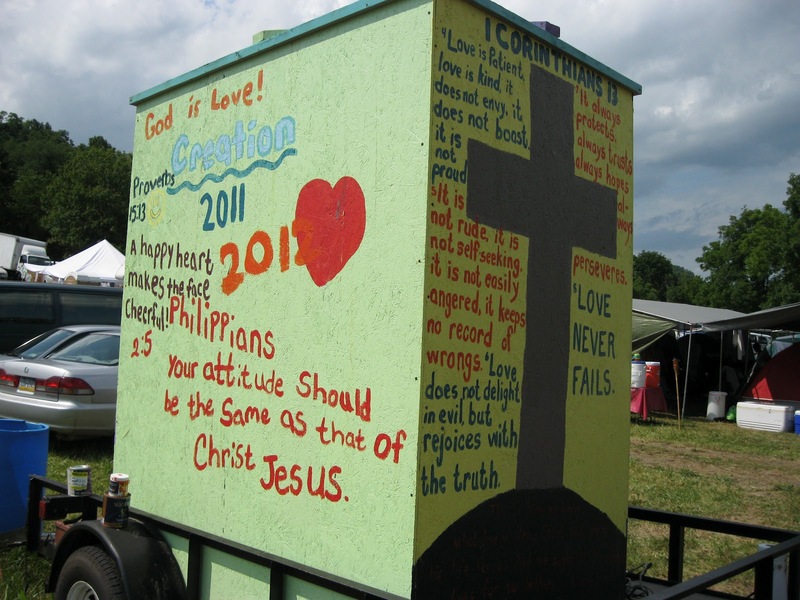 Sponsored by Liberty University and World Vision, Creation 2012 featured music, speakers, prayer gatherings, and nonprofit groups for three days in the Pennsylvania countryside. 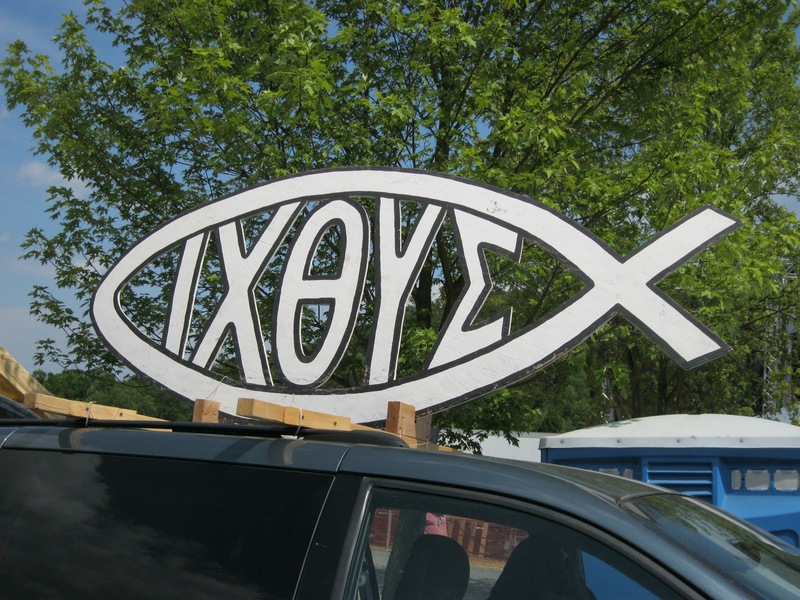 I attended the festival to see what, if any, Religious Right influences were present, but fortunately such influences did not dominate the event. The drive to Agape Farm Center took me across southern Pennsylvania's lush landscape of rolling hills, forests, and farmland. When I arrived at the Creation 2012 entrance, I was asked to fill out a waiver form with my name, address, and telephone number, the first time I've ever had to do so to attend a festival. Once inside, the first things I saw were thousands of tents, RVs and buses surrounding the festival grounds. Thousands of people had camped out on-site to enjoy the three-day festival, and visitors had to navigate around the tent city to reach the festivities. Teens were splashing in one of Agape's streams, while families were grilling their lunches and trying to stay cool. 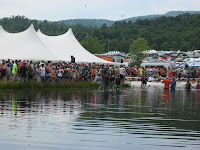 Past the tent city was the main stage, where the festival's most prominent acts performed. Smaller stages dotted the festival map, as did clearings in the nearby woods where speakers were scheduled to talk. In one wooded clearing, a shofar bellowed as a drumming circle played. 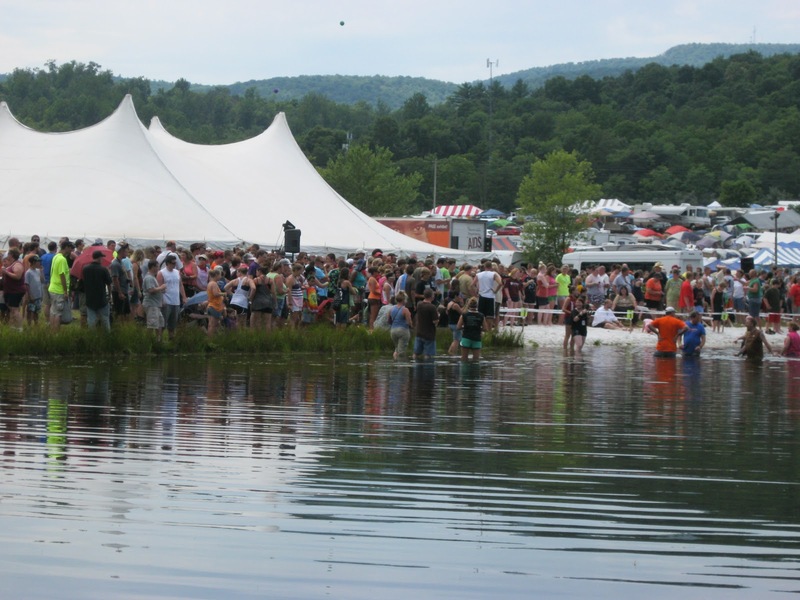 Pastors were baptizing dozens of believers among the foxtails in Agape Farm's pond. In an area dedicated to group prayer, believers prayed with their hands on each others shoulders, clustered near men holding signs that read "FAMILY ISSUES" or "MEDICAL ISSUES." World Vision welcomed visitors into a tent exhibit on HIV in Africa. Food vendors sold delicacies such as bison burgers, chicken kabobs, fair trade coffee, ice cream, chocolate-dipped frozen cheesecake slices, and more. Housed within several barns were merchants and nonprofit groups. To escape the oppressive heat, I walked through the shady barns, where vendors, Christian colleges, and nonprofits drew attendees to their tables. The vendors were a cross-section of Christian life, representing both conservative and progressive Christians. On one hand, Pennsylvania Pro-Life Federation manned a table, displaying plastic fetus models, anti-abortion buttons, stickers, and other wares. A bookstore sold inspirational and ministry-related books alongside works such as Ray Comfort's Intelligent Design Vs. Evolution and Ravi Zacharias' The Lamb and the Fuhrer. A button merchant sold buttons with anime characters, kittens, pro-Christian slogans, and messages such as "Even Darwin Believes Now" and "Don't put a question mark where God put a period." An honor-system table shared bumper stickers with slogans such as "When schools had prayer & Bibles, they had no drugs," "Evolution: when "scientists" made monkeys of themselves," "Stay-at-home moms rule the world," and "Abstinence pays: who wants genital warts?". Yikes. On the other hand, I was relieved to see many organizations at Creation 2012 devoted to social justice and global aid. Among the tables were organizations such as CURE (a medical aid organization that provides surgery to disabled children), Abolition International (an anti-trafficking organization), USA Cares (a nonprofit that assists returning veterans), Back to the Roots (a fair trade company with anti-trafficking and anti-poverty initiatives), and many more. Fortunately, such social justice organizations far outnumbered right-wing groups in the barns, to my surprise and relief. I attended a 2 p.m. talk by Tony Nolan entitled "God >Satan" in one of the forest clearings. Under the forest canopy, Nolan spoke from a small wooden platform to hundreds of listeners. Nolan used many of the preaching techniques I've observed with other evangelical preachers, such as using a booming voice, exuding energy, and encouraging the audience to repeat certain words. For example, Nolan stressed that God is greater than Satan, and to drive the point home, he asked the audience to shout "DUH" in unison. Nolan's talk centered on how people's fixation on prior mistakes can blind them to God's power. He recounted the story of Isaiah's face-to-face encounter with God in Isaiah 6, in which Isaiah felt unworthy to behold God because he had "unclean lips." One of the seraphim cleaned Isaiah's lips with a hot coal, and Isaiah later received a commission from God himself. Nolan used the story as a metaphor for how some people obsess over past mistakes and forget that God wants to deliver them. Just as Isaiah did not run from his awesome and terrifying vision of the divine, so too must Christians not run from what God wants to do in their lives, Nolan insisted. Christians must not run from God's plan, he said, even if it appears strange or potentially harmful. God is "shrouded" in life events that seem mysterious, painful, or ready to hurt us, he explained. While I agreed with Nolan's main premise -- that we should not let the past paralyze us -- I took issue with his claim that the divine plan may manifest in events that appear harmful or painful. I worry that this kind of attitude may prevent some people from withdrawing from unhealthy or dangerous situations in their lives. Sometimes, pain and alarm are our mind's way of urging us to exit a bad situation, and should not necessarily be ignored. I attended Creation 2012 to see what, if any, Religious Right themes might be apparent at a Christian music festival. Although the barns featured tables from two anti-abortion groups, and some of the vendors sold right-wing wares, I did not detect a strong Religious Right presence at the event. The organizations and speakers at Creation did not focus on hot-button social issues or politics, at least not during my time there. 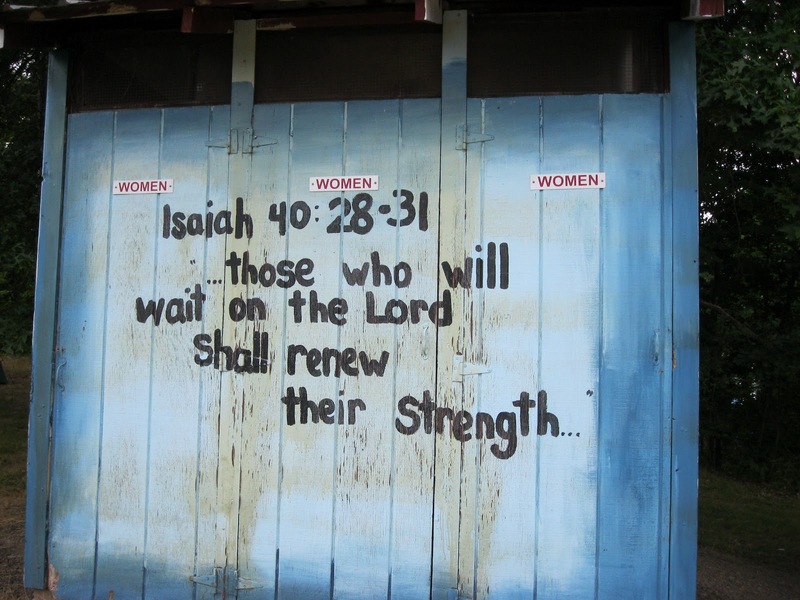 Rather, the event seemed to focus on bringing Christians together, strengthening their faith, and alerting them to a wide variety of social justice issues (i.e., poverty, trafficking, HIV). 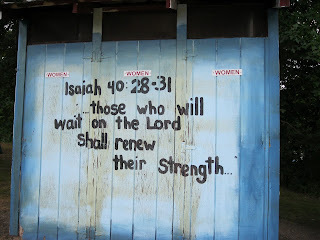 Because I only spent a few hours at Creation, I did not have a chance to take in many talks or musical performances, so I may have missed other content. Still, Creation did not strike me as sinister, but rather as welcoming and pleasant. I've known many caring and responsible religious conservatives throughout my life. It's nice to know they still have a voice in some circles. Was the music any good? Donna -- I'm glad their voices are being heard too. I left Creation with a sense of relief -- relief that the fundamentalists are not the dominant voices in the Christian community. First, as I read your report and commentary, the thought crossed my mind more than once, Ahab, that you are the genuine article when it comes to being a journalist, in the best sense of that word. You laid out the facts, gave your opinions, and clearly distinguished your opinions from the facts. Combine that with keen observation. I just wish what you've accomplished here was not so rare these days as to be quite remarkable. Second, in reference to your remark, "Fortunately, such social justice organizations far outnumbered right-wing groups in the barns, to my surprise and relief". Am I right to think that the newer generations of Evangelicals are more inclined to take up such social justice causes than the older generation -- the generation of Dobson, Falwell, and Robertson? And am I also right to think that the newer generations are less inclined than the older to support the attacks on GBLT rights, women's rights, and such? Last, was this predominately a gathering of Evangelicals or was there a fair representation of other Christians, too? Thank you for a post well worth the read. Paul -- Thanks! It would seem that younger generations of evangelicals are more socially conscious on a variety of issues. As for attacks on LGBTs, women's rights, etc., I'm not sure. Research seems to suggest that more young Christians are rejecting the homophobia of their elders. However, from the anti-abortion gatherings I've observed, there are still some religious young people fighting reproductive rights. Creation 2012 seemed to be mostly evangelicals, judging from the speakers and tables. However, they did host a Catholic mass in the worship space while I was there, so some ecumenicalism was present. I saw pics of the event posted on another site. Decidedly creepy. I share your relief that the fundies aren't the dominant voices in the Christian community (though they certainly are the loudest and most vicious). Buffy -- Good to see you again! Do you recall the site in question? Buffy -- Many thanks! I'll edit the post with this link in a few minutes. Huh. The Buzzfeed photojournalist didn't see anyone at the prayer tent, but when I was there, I saw dozens of people praying. Maybe it was the time of day? Great reporting, Ahab! It always makes me happy to hear when Christians are focusing on the more-positive aspects of their faith, and I love the fact that gatherings like these are spurring on the social consciousness of the younger generation. Wise Fool -- Thanks! There's definitely hope and progress here. What a relief for those of us who assume that those who claim to be Christians and yet have no interest in acting like Christians are not the majority. Maybe I need new Facebook friends? I hope to be around more now that my computer is operational. Left Leaning Lady -- Glad to hear it. You're always welcome at Republic of Gilead. I think there are at least two filters happening here-one is the one Paul brings up above about the crowd being made up of younger people (and adults who enjoy working with younger people). This tilts the scales toward more science education, internet as a main source of information, and more interaction with adults and peers who are openly gay. Even if some waffle back and forth over issues like creationism and LGBT rights, they are overall a chilled out and open-minded group. The second filter working here--and I wouldn't kid you about this--is that many fundie churches and groups who are loudest about being anti-gay and anti everything also teach that Christian rock/pop music is "of the devil." They think it's just as bad or worse than secular stuff, because it deceives people into thinking that it's ok. I would have to dig, but I remember looking at some websites for fun back in the day, and their purpose was to list Christian bands and singers, and show little pieces of evidence that they were in league with THE DARK LORD HIMSELF. So needless to say, those types wouldn't have been at Agape, Ichthus, Newsong, Pulse, or any other of the Christian music festivals that go on in the summer. Ah, Christian music--good times. :) I would feel like a stranger in a strange land at one of those festivals now. Michelle -- Thanks so much for your input. I hadn't considered those filters, but they shed light on why Creation had the themes it did. There are still fundamentalists who scorn rock music? Jeez! If someone doesn't love rock, they need to question their soul. About the stranger in a strange land feeling -- I've definitely felt that way at right-wing conferences and marches, but I didn't feel that way at Creation. Maybe it was because everyone was gracious and friendly, or maybe it was because of the non-hateful atmosphere.